One of the larger and more interesting Euphorbia species is Euphorbia lambii. 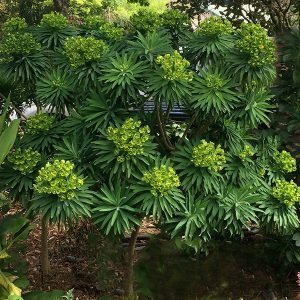 Commonly known as the Tree Euphorbia, it can reach to 4.5 metres in height, usually smaller in cultivation or if grown in containers. This is drought tolerant easy care evergreen plant originally from the Canary Islands. Foliage is a mid green and the rosettes of flowers that cover the plant in spring appear as rounded clumps. In most gardens this plant seems to reach around 2.5 meters in height with a spread of around 2 2 metres in the crown. Grown in an open position, it forma a nice symmetrical habit. The crown of the plant rising above a clear woody trunk. Fast growing, use this fascinating plant in a sunny position in a well drained soil. it is suited to grow as a feature plant in a container in a sunny courtyard, or perhaps as a feature in the succulent garden. In a well drained soil, Euphorbia lambii will require very little extra care. Some slow release fertiliser once a year should be adequate. In the garden, little to no watering will be required. In containers, watering will be required through summer, however allow the soil to dry out between waterings.